Wow... it looks a lot simplier than I thought it will be! now i'm going to buy the ingredients and try it out as well! What is 菜油? Is it really just vegetable oil? It's not hard, take some time to knead those little balls though. 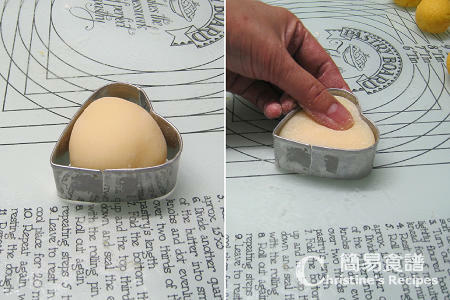 You've got plenty of time to make some for the coming Mid-Autumn festival. thanks christine! i'm going to try it! 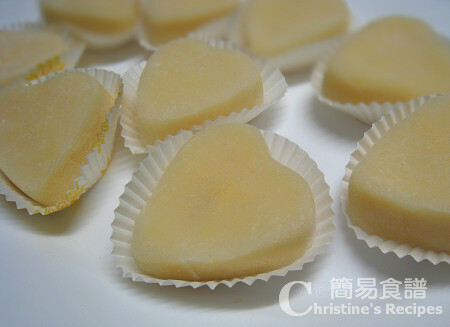 You should have no problem to get 吉士粉 (custard powder) at any supermarkets. It's a very popular product. Ask the staff to help you find it. Oh this looks delicious! Thanks for sharing! Look back what and how many you have added and check them out with the recipe posted here. I can't diagnosis your case just based on the limited info you provided here. However, the glutinous flour should stick together. Knead the dough with your hands until the dough sticks together and smooth. It'd take some time to get them stick together. I wanna say the steps for custard filling didn't mention when to add sugar ar...so failed for the first time. 1. i can't get cooked glutinous rice flour from supermarket, is this step (把另外的3湯匙糯米粉用白鑊（即沒水沒油）炒熟，見有煙冒出，粉轉微黃及聞到粉的香味。) making for 熟糯米粉（糕粉） 2湯匙 ingredient? 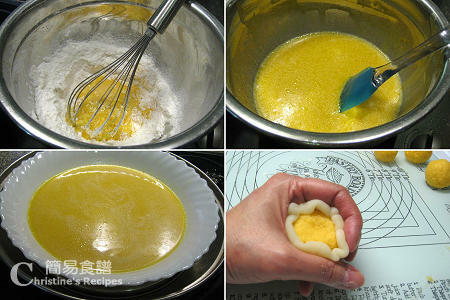 2. is the cooked glutinous rice flour with 2 spoonful (熟糯米粉（糕粉） 2湯匙) or 3 spoonful? When you steam the dough, do you use a bowl or plate? And do you steam it in a wok? Have you got the lid on? Both my dough and filling were steamed in a wok without any foil or cling film on the plate, but with wok lid on of course. I live in a small town in USA. There are only 3 supermarkets and I checked each of them but cannot find custard powder. The staff didn't know what that was either!! In what department do you find yours -- baking or spice or ...? If I still can't find it, do you have any suggestion for substitute? Thanks! Custard powder is commonly placed in the section of all bakery things in all supermarkets. I guess you might replace it with egg yolks. I haven't tried before. You might like to test with a small amount. I'll look again. Thank you! 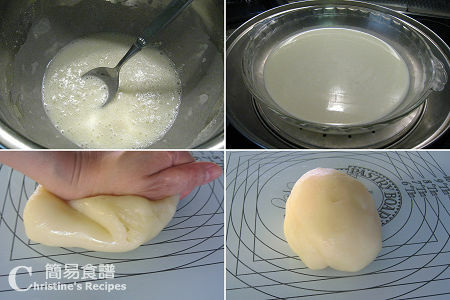 糯米粉 is glutinous rice flour, and 粘米粉 is rice flour. I used your recipe for the ice skin today. Instead of steaming it, I microwaved it for 2 minutes (it's so hot here that I am avoiding steaming if I can). It worked! Thank you so much for the recipe! What is 澄麵？Where we can buy in Brisbane? Thanks! 澄麵 is called wheat flour. You can get it from Asian stores, like 袁氏，頂好.